Fall is my favorite time of the year. The weather is cooler, without being cold and the leaves turn beautiful colors. Best of all are the fall foods. I love anything involving apples or pumpkin. Since we are in the middle of the heat of summer it can be a little hard to want to cook. The humidity has been very high and the temps were in the 90's today. Needless to say it doesn't make me want to cook. It leaves me thinking of all the great things to come in the fall. So I decided to try some fall like foods for dinner tonight. I tried a new recipe for Pumpkin Chipotle Pasta Sauce from the new All Recipes magazine. This recipe has 12 ingredients. It takes 25 minutes of total time, all of which is active and makes 4 servings. I followed the recipe mostly as written. I make my own chicken broth since it allows me to control the amount of salt (and it tastes better). While the original recipe uses butter I substituted extra virgin olive oil. I prefer cooking with olive oil since it is healthier for the heart. Since Vidalia onions are in season that is the type I used in this recipe. They really are delicious. I allowed my onions to caramelize before adding the pumpkin. I hate half cooked onions in recipes, it turns me off. If you are making this for more than two people you really need to double the amount of sauce. As written it was barely enough for three small sized portions. My husband likes lots of sauce and this needed more to fully coat the pasta. I liked that the chipotle peppers gave it a nice kick, if you like spicy foods you can increase the amount or seed the peppers to reduce the spiciness. 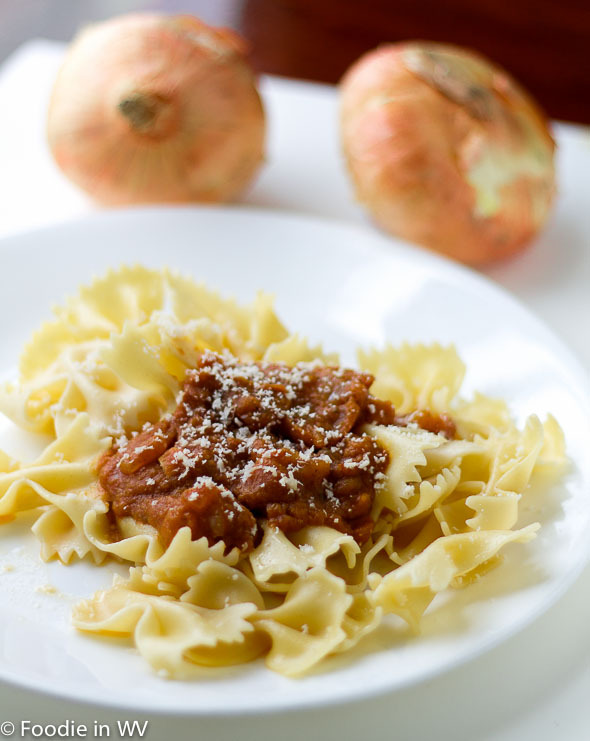 For the recipe go to Pumpkin Chipotle Pasta Sauce. It would be a great october dish, I agree! I love pasta (being Italian!) and lately I have been experimenting with some new toppings - will definitely add this to my list - pinned! Thanks for the pin :) If you try the recipe tell me how it goes! Wow those sound like wonderful fall flavors! And it looks like a very healthy recipe too. Must give it a try! It really is healthy, the calories and fat are both low. This doesn't have an overly pumpkin flavor. It tastes a lot more like chipotle. I don't love the taste of pumpkin, but this one sounds interesting. I'd actually like to give it a try. I had some pumpkin ravioli once and it was so good. I'd love to try this. This sounds very interesting. I do like pumpkin, including pumpkin-filled pastas. I love chipotle. Thanks for the recipe. Yum, I've always love the smokiness of the chipotle pepper. It really made the pasta sauce looks so luscious with that deep red color. I love the smokiness too, it adds great flavor! Those muffins are yummy, so I don't blame you :) If you try this recipe tell me what you think!